Atlus have announced that they are to publish MAHJONG CUB3D, an addictive, intuitive tile-matching puzzle game from developer SUNSOFT (SUNCORPORATION in Japan) across North America. Players will find themselves enthralled in hours of mind-bending fun, as they match colourful Mahjong tiles in 3D to solve and unlock dozens upon dozens of puzzles across three modes and varying difficulty settings. Cube Mode will see you rotate the puzzle in 3D and match identical tiles in a race to clear them from the board before time runs out, whereas Classic Mode will see you play solo in the usual brain-teasing tile-matching puzzle game. Also, fans can challenge a friend or family member in Vs. Mode via Download Play. MAHJONG CUB3D will keep players coming back, striving to unlock more puzzles each time. With 200 puzzles, three different modes and difficulty settings, plus the ability to compete head-to-head with a friend, this addictive 3D Mahjong game provides an abundance of fun, replayability and value! 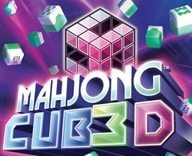 MAHJONG CUB3D for Nintendo 3DS is due to release in Summer 2011 across North America, with no word yet as to a European release.